Self Storage in Leesburg, VA 20175 | Self Storage Services Inc.
Fort Knox Self Storage – Leesburg is conveniently located just off US Route 15, directly next to Bellemeade Farms Apartments, allowing us to serve the communities of Leesburg, Lansdowne, Ashburn, Purcellville, Hamilton, Broadlands, Woodburn, and others in Virginia. Come by and visit us! If you live or work in Leesburg, Lansdowne, Ashburn, Purcellville, or other nearby communities, you’re sure to love our storage options! Moving is never easy, which means you need someone who helps you through the entire rental process and takes some of the weight off your shoulders. While offering useful amenities and plenty of space is a must for any self storage business, there is more to it. Sometimes just being a ray of sunshine during a very stressful situation can go a long way. Our resident manager is always happy to help our tenants in a pinch and provide great customer service. Family road trips and fishing weekends are great, but what should you do with your boat or RV when it’s not being used? 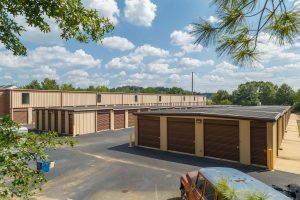 Enter Fort Knox Self Storage – Leesburg! Our parking spots are great for nearly any kind of vehicle, including cars, boats, RV’s, and motorcycles. You could leave your vehicle on the road, but that isn’t ideal in terms of security. Whether you’re seeking a short or long-term arrangement, we can help you choose the right space for your vehicle. Plus, our friendly team is here to answer any questions you may have, so feel free to call us!